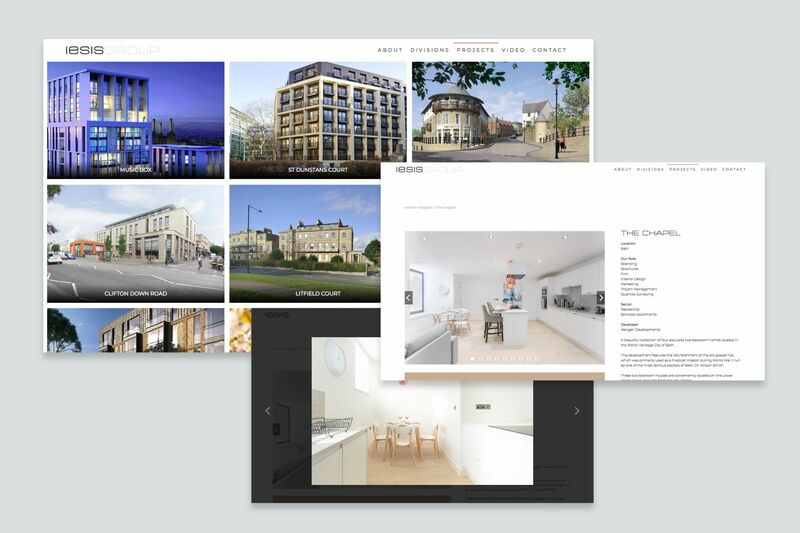 Iesis Group specialise in bespoke property consultancy, development and engineering schemes. Dedicated to delivering an excellent standard of quality, their ability to handle complex projects with wide professional expertise is paramount to their business model. 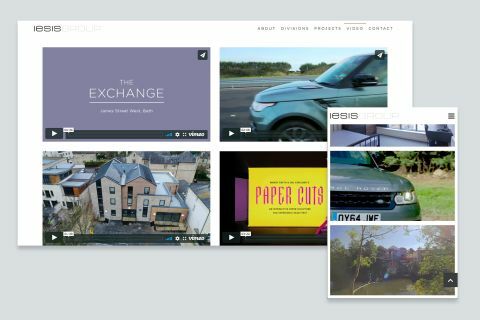 We were asked to design and build a new website to reflect these core values, whilst providing information about the company and showcasing their impressive portfolio to their target audience. The result is a clean, contemporary and user-friendly site which is a highly fitting representation of the Iesis Group brand. The homepage creates a striking first impression by incorporating eye-catching, full-screen imagery. Beneath, clearly organised links to each division of the company are presented with the option to ‘view more’, linking through to the specific division pages. A fixed-position scroll-to-top button allows smooth-scrolling back to the top of the page, a feature which is present across the entire site. A fixed navigation bar positioned across the top of the page further reduces the need to scroll. The company logo is positioned to the top left, directing the visitor back to the homepage when clicked. The footer of the site features an open search bar, enabling visitors to browse content relevant to their search terms. An innovative People page presents category links allowing visitors to filter by expertise, using Isotope animation which has the benefit of zero load time. 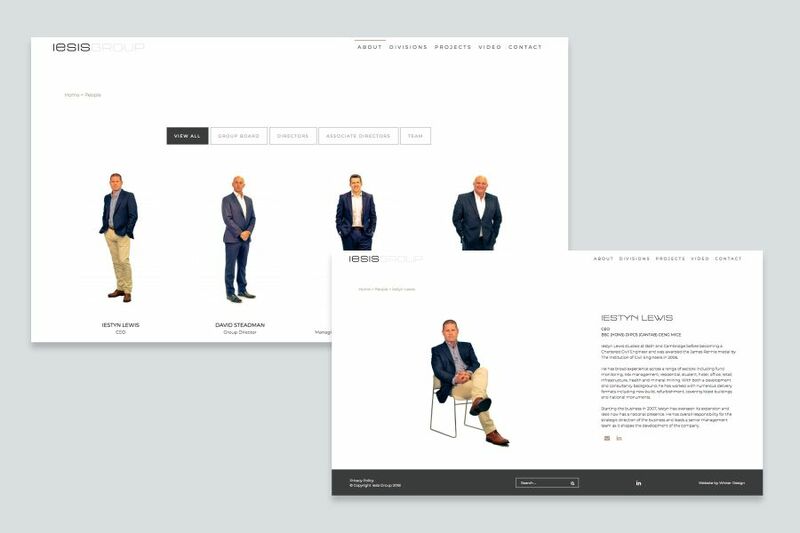 Each profile image links through to an individual biography, including contact buttons for direct email and LinkedIn profiles. 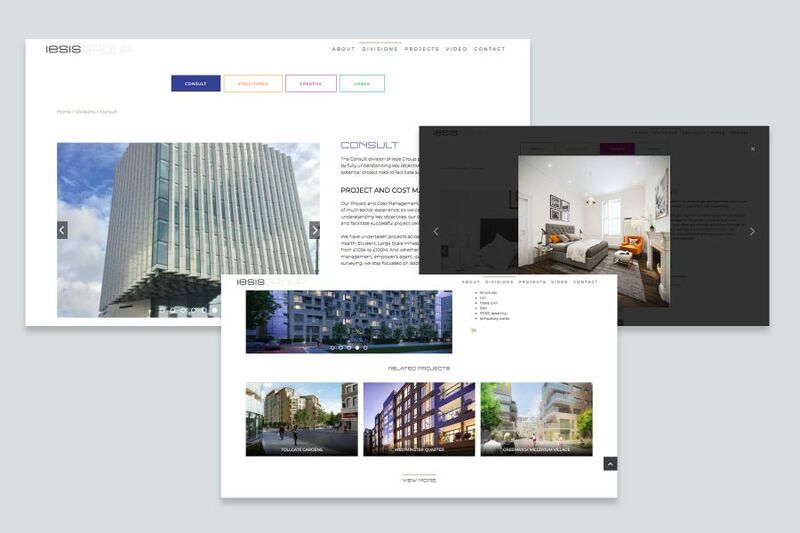 The Divisions section directs the visitor to further information, including image galleries to showcase a range of division-specific project examples. At the bottom of each Division page are links to related projects, to encourage the visitor to read more. The inclusion of social media links directs the visitor to each division’s individual LinkedIn page. 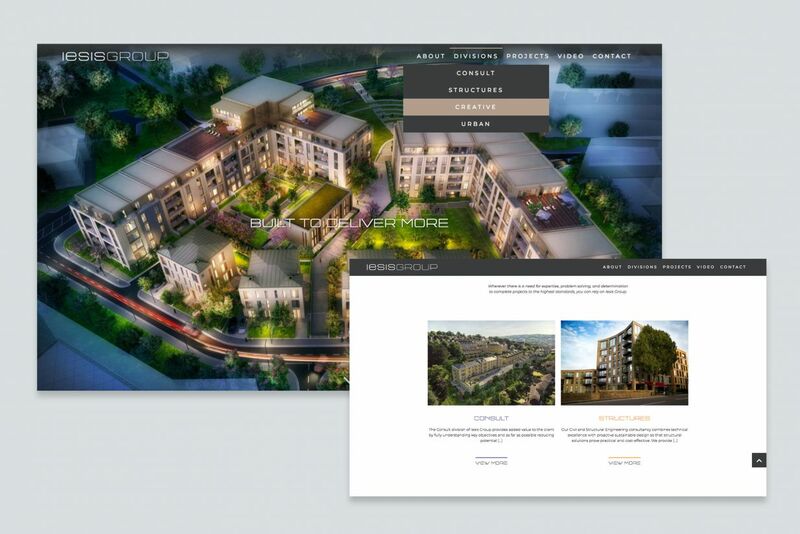 A dedicated projects section showcases the company’s broad variety of work, amalgamating strong imagery with project information broken up by subheadings. A pair of drop-down menus allow the visitor to filter projects by divisions and sector, again using Isotope animation. 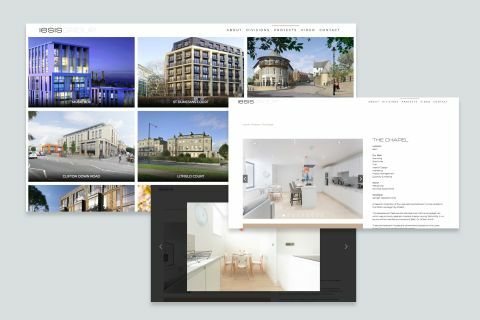 A two-column layout presents images in a lightbox or masonry grid layout depending on their context within the page, maintaining variety and consistency. Iesis Group use video as a channel for promotional and informational communication, and a purpose-built video page seamlessly incorporates these short films into one gallery, for quick viewing. Finally, a three column contact page presents the three company offices above the fold, whilst incorporating links for direct emailing and FaceTime/Skype, making instant company contact possible. The website is entirely mobile friendly and fluid-responsive, with features such as collapsible menus and full-width imagery used to maintain the dynamic and sophisticated feel as seen on desktops. 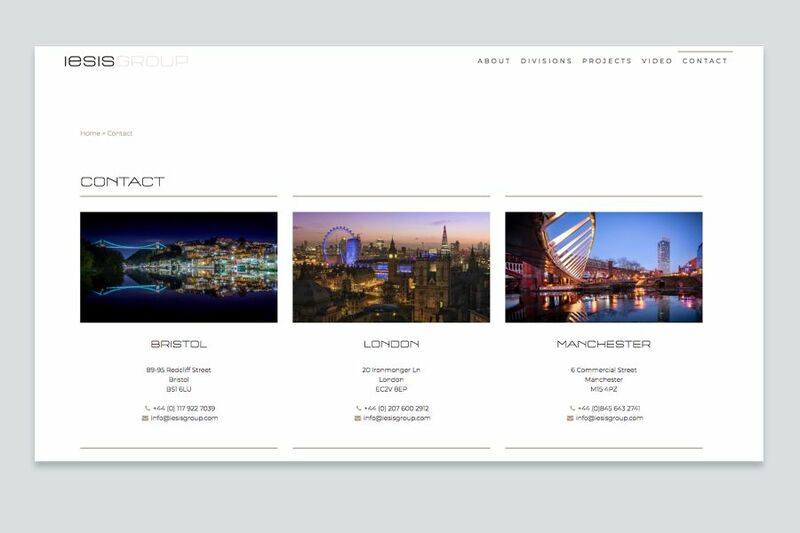 To experience the website yourself, visit iesisgroup.com.